From the air, São Paulo's poor suburbs are an endless sea of gray pockmarked by orange-brown rectangles. These are football pitches, or so-called "plain football" grounds, rough patches of earth where everyone from amateur-leaguers to teenagers play. Pictures of these fields, shot from a helicopter by 35-year-old São Paulo photographer Renato Stockler, are part of an exhibition featuring photos by some 40 photographers with the theme of Brazilian football. The images will be on display in galleries and shops and even will be projected onto walls of one neighborhood until July 17. The project, called Mostra Futebol BR, aims to show the central, unifying role that football has in Brazil, and how it is played everywhere — from the Amazon river basins to the dirt fields in South America's most populous city. 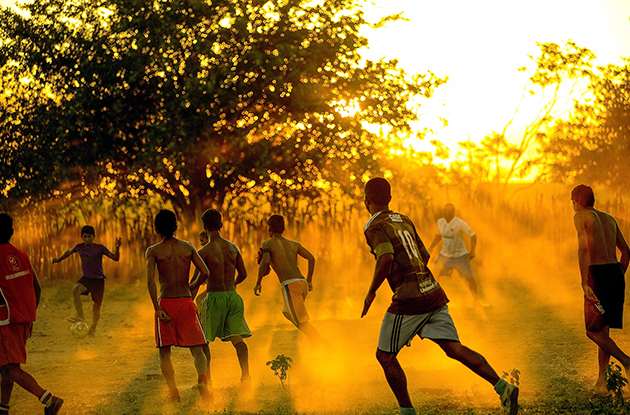 It was on these kinds of fields that great Brazilian players such as Ronaldo and Pelé learned to dribble, shoot and score — often growing up in poverty and playing barefoot, just as millions of Brazilians do every day. "There are very few leisure spaces that are public and very few spaces that are community. These football pitches are the last spaces," Stockler said, speaking by phone from São Paulo. "They have a big, important social aspect." The World Cup begins at the Itaquerão stadium in São Paulo's endless suburbs on June 12 with a match between Brazil and Croatia. But the tournament millions of viewers will watch worldwide is a shiny, television-friendly version far from the reality of most Brazilians. "We are going to show where the Brazilian greats come from. The anthropological, social football of Brazil. This is the spirit of the project," said Fernando Costa Netto, a curator of the exhibition and a partner at the DOC Gallery that organized the project. The gallery will give away 40,000 coasters printed with images of football balls photographed all over Brazil by Caio Vilela. None of them are the official Brazuca World Cup ball that sells for $174. 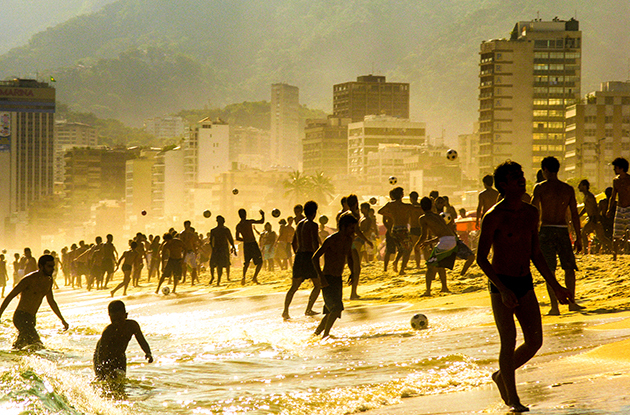 "The true football is where Brazilians live football — on a mud pitch, any space on the beach, in the street. It is football rooted in the Brazilian culture," said Mônica Maia, Netto's fellow curator and gallery partner. Football is omnipresent in Brazil: it is the NBA, little league and the World Series rolled into one. The game is played wherever possible, as São Paulo photographer Henrique Manreza, 33, discovered when he took a four-month sabbatical from photographing executives for a business newspaper to tour Brazil's remote jungle-clad north. In the northern city of Macapá, he photographed children playing football on the mud banks of a tidal river when the water retreated. "They call it 'mud football,' " he said. The exhibition includes photographs he took of street matches in the remote town of Benjamin Constant, on the border of Brazil, Colombia and Peru. "You see simple people playing football in a very simple way. You don't need big luxuries to play football," he said. As Brazilian anthropologist Roberto DaMatta argued in a 1982 essay, the football pitch in Brazil represents a level playing field in a country that desperately lacks them. "Here the rules don't change, and this makes everyone equal on the field of contest," DaMatta wrote. In Brazil's unequal society, the family you were born into and who you know often count more than genuine ability or talent, and people bend the rules to get ahead. On the football pitch, there is no hiding a lack of ability, and players bend the ball, not the rules. Perhaps this is one reason why Brazilians instinctively love the sport so much. As the World Cup looms, the idea that football can represent equality is gaining currency. On Thursday, an exhibition called "Football for Equality" opens at the Museum of the Republic in Catete, in central Rio. 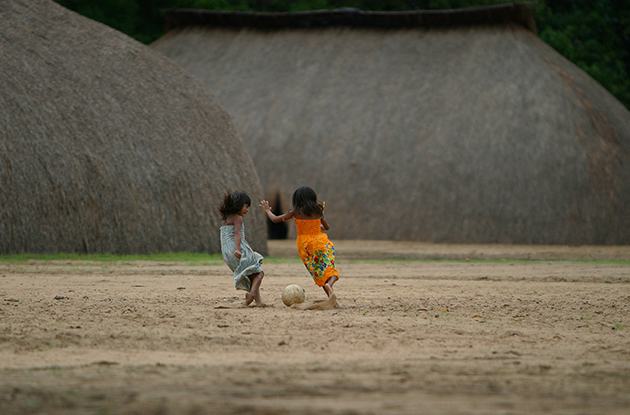 It includes a photo exhibition of women's football and mini-pitches for children to play futebol3, a mixed-gender game played without a referee. Last Sunday, football was being played all over town. Along Aterro do Flamengo Park, boys played barefoot on asphalt pitches. Under the trees, a samba ensemble rattled through a rehearsal. Brazilian players are prized the world over for their individual flair. In the park, the samba rhythm does not distract the players. If anything, it spurs them. "This is the best that Brazil has to offer to the world — football and music," Netto said. "This is the DNA of Brazil." Up a nearby hill, in the cobblestone, bohemian neighborhood of Santa Teresa, 30-year-old Jorge Luis had just finished playing a Brazilian form of football with five players on each side called futsal, for the local Largo dos Guimarães team, on a concrete pitch in a small park. The players sat around chatting, some drinking beer. One wore a shirt for London's Chelsea Football Club — one of the richest teams in Europe, where four of Brazil's World Cup squads play. Toddlers train on this pitch. Teenagers play barefoot, or with one sneaker and one bare foot, having divided a pair between two. The game never stops. "There is always somebody playing here," said Luis, who works in his father's bookstore nearby. Futsal helps Brazilian players develop their exceptional ball control. "They play in a small space and have to learn a lot of skill," said José Carlos Barbosa, 39, a delivery man for a construction store who organizes the team's matches. The players are deadly serious about their sport: nets are hung on goal posts, teams wear identifying vests — there is even a referee with a whistle. Mauricio de Moura, 38, showed off a fresh cut on his elbow and deep grazes on his hips from a fall during a match. "It is a hard game; it's not a joke," he said. Every Wednesday, de Moura, a painter and handyman, coaches children and teenagers. He called over 14-year-old Gabriel Souza, an aspiring goalkeeper with dreams of playing for Rio team Flamengo, the most popular football club in Brazil. "It is a very good sport for a carioca, for a Brazilian. It is the sport we have most fun with," Souza said. Both said they would be watching the World Cup.